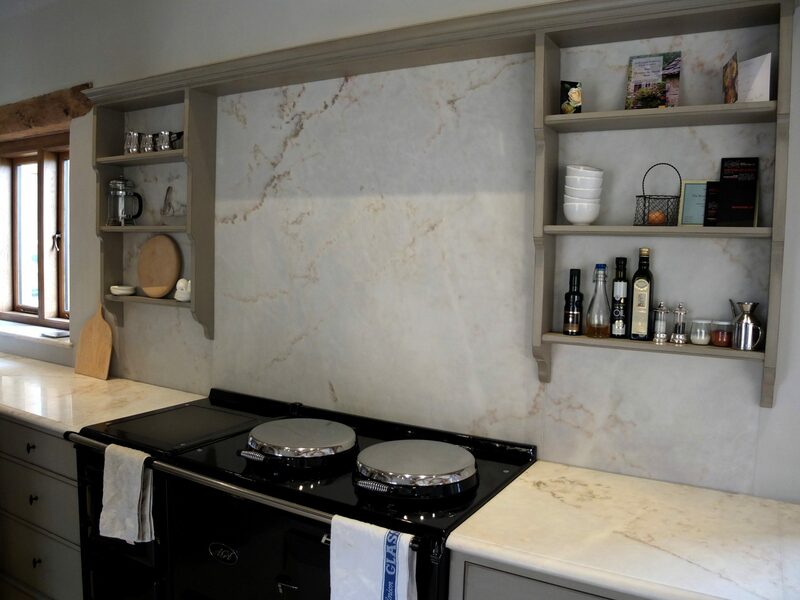 What Granite and Marble for Luxury Kitchen Worktops? During the design process of any bespoke kitchen, discussions will inevitably reach the marble or granite worktops question. Choosing the right stone for kitchen worktops is not straight forward. Each have their pros and cons, and there is no right or wrong answer. Hopefully this blog post will act as a useful guide for each material, but feel free to contact us if you’d like to discuss your options. In our view, marble is the most beautiful kitchen worktop material. Generally the patterns, hues and colours available in marbles are softer and more elegant than granite, so we prefer them aesthetically and we feel its beauty outweighs its flaws. Marble types vary in density, porosity and mineral content, and they will all stain if acids (such as red wine and lemon juice) are left on them for hours unchecked. However, if your marble surface is sealed and the offending material is removed quickly, you should be fine. Marble is also softer than granites so it will etch and antique with wear. It is similar to timber in this respect and it will create its own beautiful patina over time. We see this wear as an attractive quality. We discuss Marble in greater depth here. Granite worktops are the most robust of all natural kitchen worksurface stones. It is dense, scratch resistant and does not stain. It is an excellent material for use in a busy kitchen. With reasonable care, granite worktops will stay looking new for many years. In our experience, because granites are the post popular kitchen stone worksurface, they also tend to be more susceptible to trend, meaning that they can also quickly go out of trend. Certainly a few years ago, polished black granite was a popular choice. Now it tends to be less so, and whenever we install it now we tend to hone it to remove the polished surface, or flame it, a process which textures and antiques the surface. Because of the way granite if formed geologically (it is volcanic as opposed to marble which is formed from sea bed activity), its patterns are, in our view, less exciting. They are typically more aggressive, bolder, harsher and less refined, and we tend to opt for using them in a scullery or pantry environment where the worksurfaces are likely to get more wear and looks are less important. A flamed surface will give worktop surfaces a texture which softens or antiques the stone, making it more interesting. It also diffuses reflections from light sources within the room. Wooden kitchen work surfaces wear quickly in comparison to stone. It is less suitable for use as a kitchen work-surface, particularly around wet areas, but it can look spectacular in a period country house environment. Our blog on kitchens in period country houses has some great images of period kitchens with wooden worktops. Oak is the most commonly used solid timber kitchen worksurface in Britain. It is warm to the touch and looks great, but it needs to be heavily protected with modern lacquers before it is fitted. Over time (in under ten years), these lacquers will wear, particularly in heavy use areas around the sink. 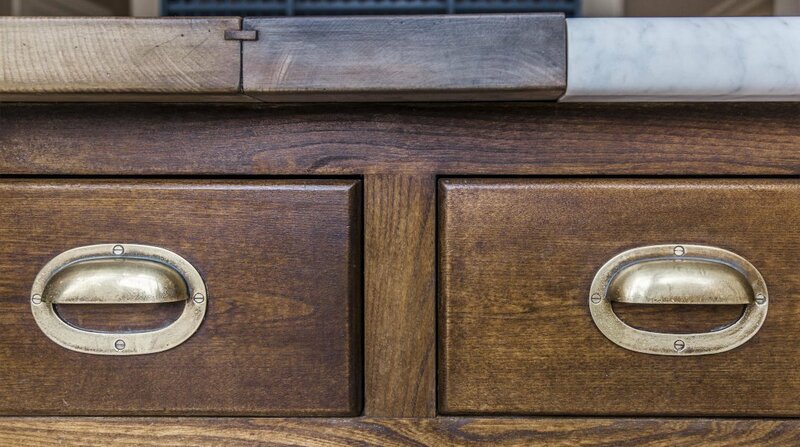 Once the lacquer is worn and water can access the oak, it will start to go black (particularly around the sink taps), and ultimately may the surface may need to be replaced. If you are going to use oak, we would suggest not using it near sinks or wet areas. The island in the bespoke Edwardian cook’s kitchen we designed for a client uses both Italian black basalt and oak, with the basalt being used for the wet areas and the oak for the preparation areas. This is a good compromise. 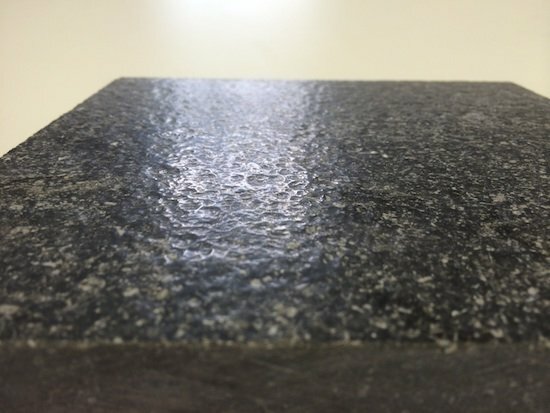 Basalt is a good alternative to Granite worktops (they are both silicates). It is hard, wears well and looks great, but mainly comes in dark colours (greys, blacks and blues) owing to the iron and magnesium that contaminates it during its formation. Artichoke used Italian basalt for this kitchen near Haslemere in Surrey. Artichoke are fans of basalt, which is warm to the touch and softer to the feel than granite. Some people think it looks a little like concrete. Slate is formed from heavily compressed clay at low heat and is very finely grained. Most slate (Welsh slate in particular) is not suitable for kitchen work surfaces. It stains easily with acid (wine, lemon juice etc) and it can chip. Artichoke does occasionally use slate from Cumbrian quarries for bespoke kitchens. These Cumbrian slates are extremely hard, extremely beautiful and do perform like granite (although can scratch a little easier). They have beautiful graining and are soft to the touch. A disadvantage is that most slates do not come in slabs longer than 1,800mm long, which is around 1,000mm shorter than the lengths available in granite. Artichoke typically use slates in pantries. Corian is an entirely man-made material formed primarily from an acrylic polymer. It is non-porous, stain resistant, heat resistant and repairable. It can be jointed seamlessly and is also flexible when heated, which allows it to be moulded into limitless forms. It burns at 212 Fahrenheit / 100 centigrade, so it will not take very hot pans like granite will, but it can be seamlessly repaired should burn damage occur. 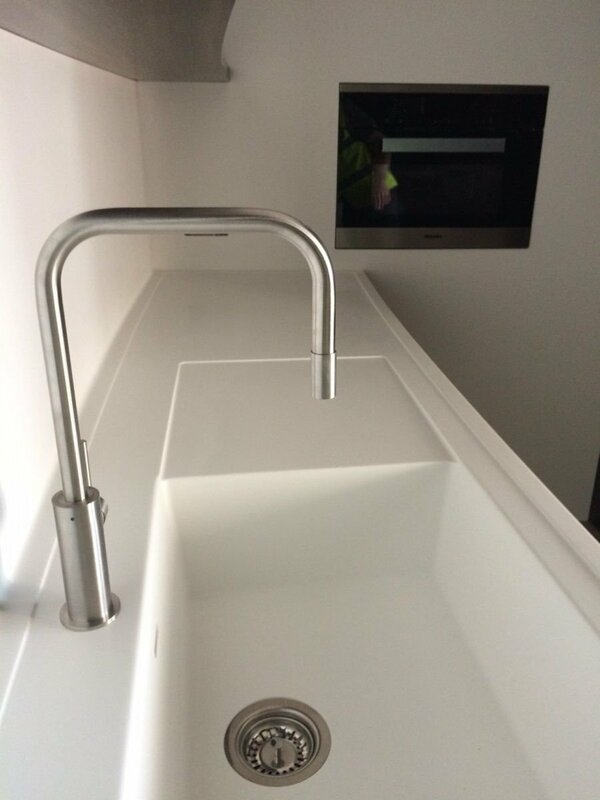 It also comes in a wide variety of colours, and because it can be bonded seamlessly to other Corian products, a worktop can mould seamlessly into a sink without any visible join, making it excellent for hygenic use. Artichoke often designs Corian into pantry environments. Being man-made, there are no natural fissures or graining, making it a great choice for contemporary kitchens in particular. In this Artichoke project, the work-surface and the backsplash were seamlessly jointed and curved at the join, meaning there are no angled corners for dirt to collect. The sinks are also seamlessly jointed to the work surfaces. The Corian work-surface in this kitchen runs seamlessly into the backs plash with no visible joins. 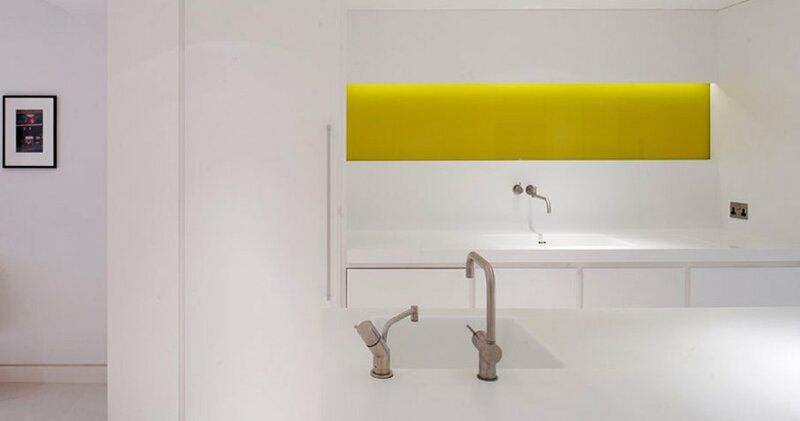 For this scullery in a circular house, Artichoke used Corian for the walls aswell as the sink. To see more details of this project, visit this page. Quartz worksurfaces such as Okite are made from three ingredients; quartz, polyester resin and colouring. Around 90% of the material is made from quartz, and it is highly resistant to staining, heat and scratches, five times stronger than granite and non-porous. It can also be “grained” and made to look like marbles and natural stone. This process is well refined now and manufacturers have it down to a fine art. It is a realistic alternative to marble but the graining can be a little formulaic. 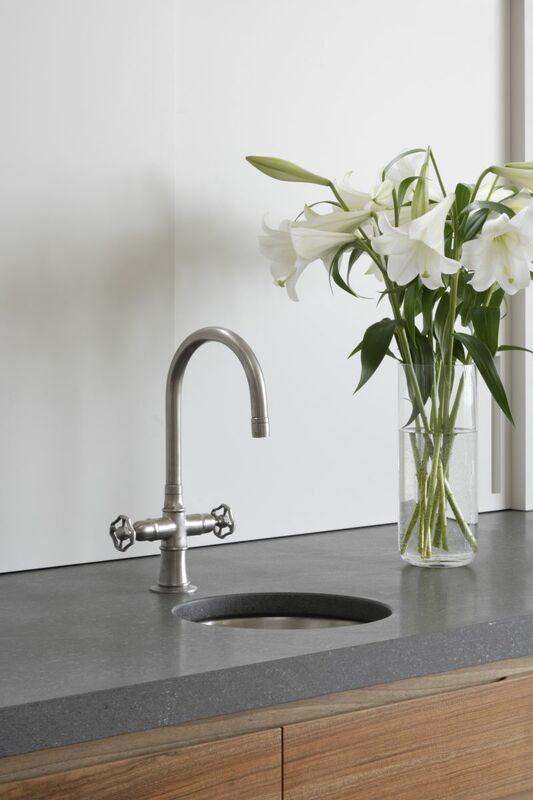 Concrete is a great kitchen worksurface, particularly if you are after a modernist / industrial look. Contrete typically comes with a smooth surface or with an aggregate surface and it can be pigmented to colour it. Depending on the shape and size of the piece, it can be cast on site or bought in pre-cast. Concrete is porous and it will mark. If you place a coffee mug onto the surface, it will mark. The same applies to oil and other liquids such as wine, and if you are fastidious about perfect unblemished surfaces, then this is not the surface for you. If you are prepared to relax and let daily life create it’s own patina however, it will look amazing in five years. A recent online discussion with Russel Taylor Architects reminded me that I had missed out an important element; caring for stone. Their comments, which I quote here word for word, are worth reading. “To be on the safe side, our suggestion would be to use a stone sealant. 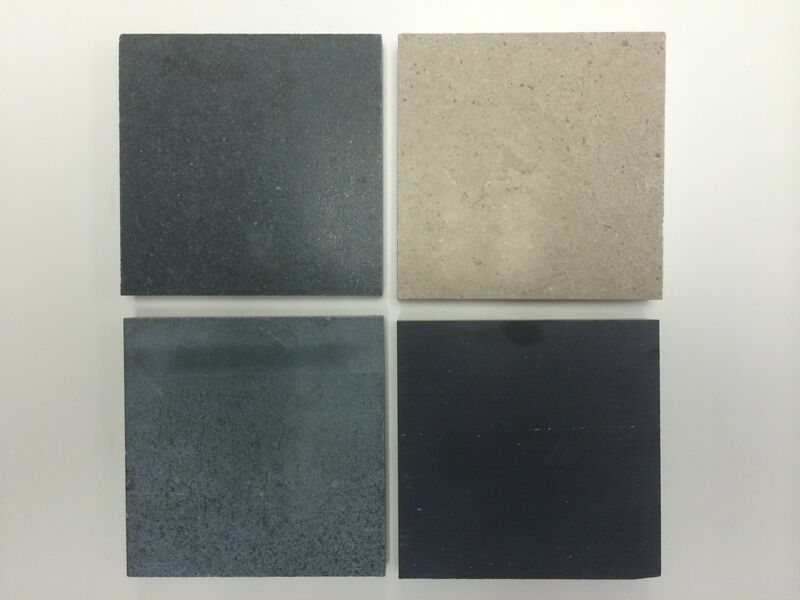 Some of the stone sealants now available on the market are very good and absolutely invisible: they are not shiny and don’t change the colour or texture of the stone in any way, but make it completely resilient to water and oil penetration. We have used successfully on stone work tops VULCASEAL V201 and Lithofin STAINSTOP, Lithofin MN Stain-Stop ECO, Lithofin Nano-TOP. Thank you Russel Taylor Architects! And in addition to that, Artichoke often provides sealed stone samples to clients to then pour wine on, leave lemon juice on and generally treat badly; this is a good way to gain confidence in what you are are buying.